the improvements ...made on her property were “far outside the norms observed by panel members throughout the town,” according to the order. Hillsborough. Enough said. I've driven the I-280 countless times and can't recall ever seeing the house. It's interesting to see what other communities consider as an "eyesore". Here's a house on a major street in town, that I often pass by often. Those aren't bushes -- they're weeds. We have a serious tick problem here. This house has been this way as long as I've lived here. I'm assuming the municipality's code enforcement department either doesn't see a problem with this, or they've been told to back off any enforcement efforts. Based on what I see in a local Facebook group, people here LOVE this place. I wish I was kidding. One of the personal challenges I face working where I do -- there's a collective tolerance of "rustic" conditions in the built environment. 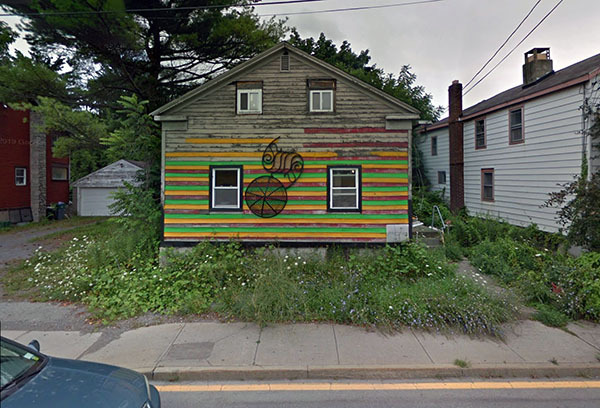 Where I see blight or an eyesore, the larger community sees "character". “The panel cannot support a project that proceeds on a ‘build first, ask for permission later’ basis,” the order said. 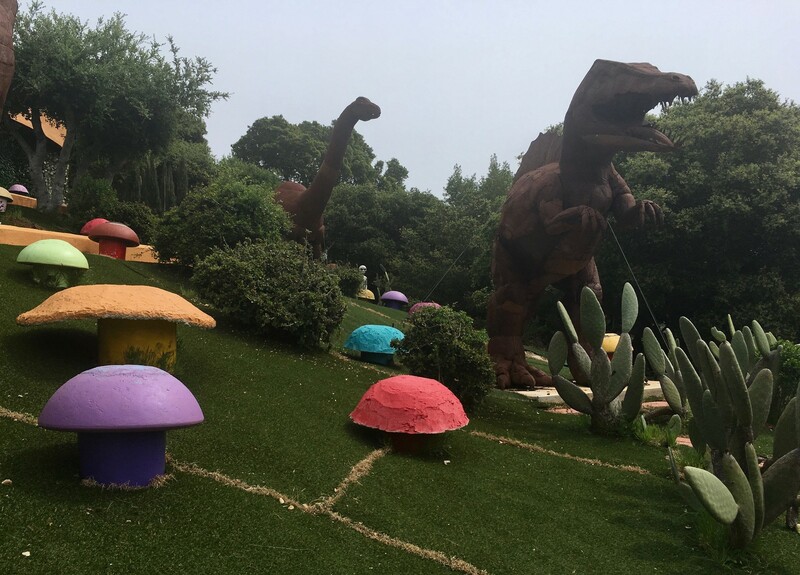 The town of Hillsborough, Calif., has sued its owner, the media mogul Florence Fang, to force the removal of dinosaur statues and other renovations to the property. How often do you get a rezoning / special use / variance application after a property has been cited for a violation ? For most of its life, the "Flintstone House" was camel-colored. The current owner has painted it an assortment of bright colors. But this is not what the city is suing over-- it the 15-foot-tall dinosaurs sculptures that were placed in the yard without a permit. Also, this is no longer being used as a private residence, but is being rented out as an "event center"? She's not going down without a fight. typically, we look for a little more content than just a link for a thread starter in the professional forums. You should express a view or pose a question. 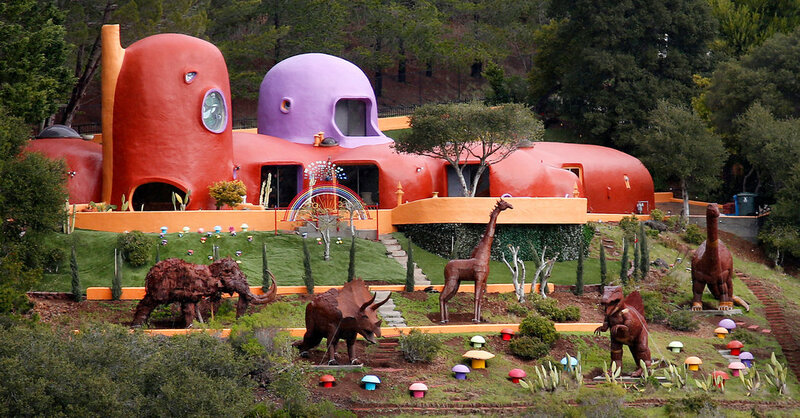 So, what do you think about the 'Flintstones' house? Is this a 1st Amendment issue? If you don't have aesthetics regulations, then too bad for you. If the building was built to code, then there isn't anything you can really do. I don't know about not being able to do anything. Maybe not the structure, but certainly the use. I mean if this thing is being rented out as an event center and that's not a permitted use in the zoning district there could be something quite definite to go after.